Adding coupons to site is a great way to attract new visitors and keep your existing ones. 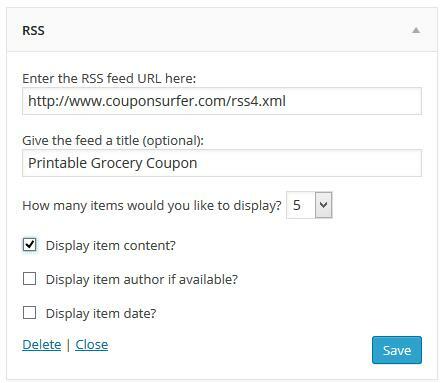 It's easy to add CouponSurfer coupons to your blog or website using our RSS feeds. Just follow the step by step instructions. Enter what title you want displayed such as Printable Grocery Coupons. Next select the number of items to display (we recommend between 5 and 10). If you want the coupon offer text displayed (i.e. Save $0.50 on Oreo Cookies), check the Display Item Content box. Otherwise just the brand name will display (i.e. Oreo Coupons). Next, select Save and the coupons will now appear on your WordPress blog. From the Blogger Dashboard/Sidebar select - Layout > Add a Gadget. A list of Gadgets will appear, just scroll down the list and select Feed. 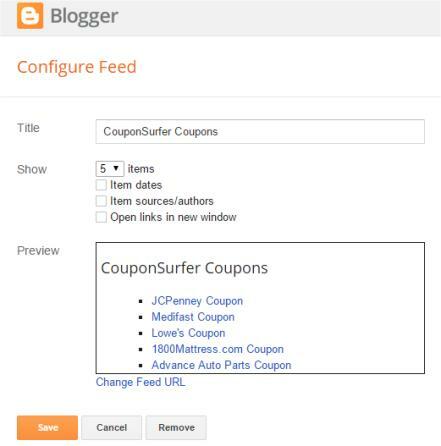 Select continue and then enter the title you want to be displayed, for example CouponSurfer Coupons. Next select the number of items to display (we recommend between 5 and 10), followed by Save and the coupons will now appear on your Blogger blog. Either of our RSS Feeds - Printable Grocery or All Coupons - may be added to your website, blog or mobile app. We do ask that any large commercial websites wishing to use our RSS files should contact us for additional information as well as exclusive custom features. Lastly, if you have any questions or run into trouble we encourage you to contact us here. Happy Couponing! How can I show the latest coupons on my website?